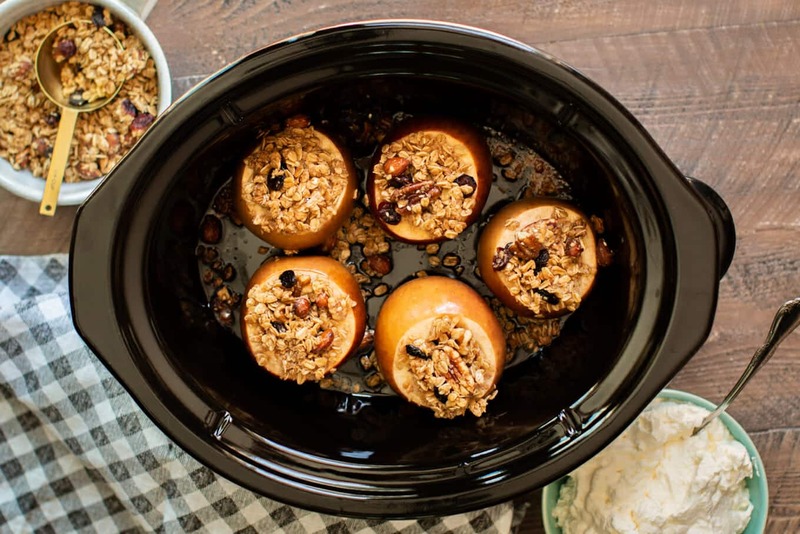 These Slow Cooker Baked Apples can be made for breakfast or for dessert with ice cream or whipped cream. I started with medium-sized Gala apples, but use your favorite apples in place if you’d like. I cut the tops off with a knife, then gutted them with a melon baller, if you don’t have a melon baller, a round measuring teaspoon will do the trick. The granola is just the perfect crispy topping, since the slow cooker can’t brown things. How easy it to open a bag of granola instead of measuring 8 different items for a crisp topping! I also drizzled a little melted butter over the apples, then hit them with some maple syrup. 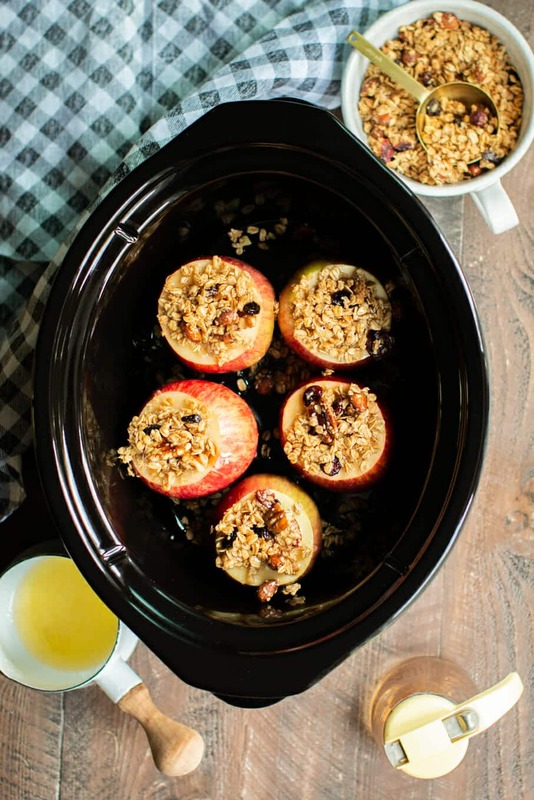 Slow Cooker Baked apples bring back so many memories of my childhood. They are so pretty, and really fun to make. I hope you enjoy this easy granola version, whether it be for breakfast or dessert! 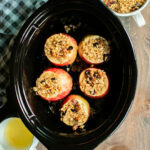 Below is my YouTube video about how to make these Slow Cooker Baked Apples. You can follow me on YouTube, here. Cut a layer off the top of the apples with a knife. 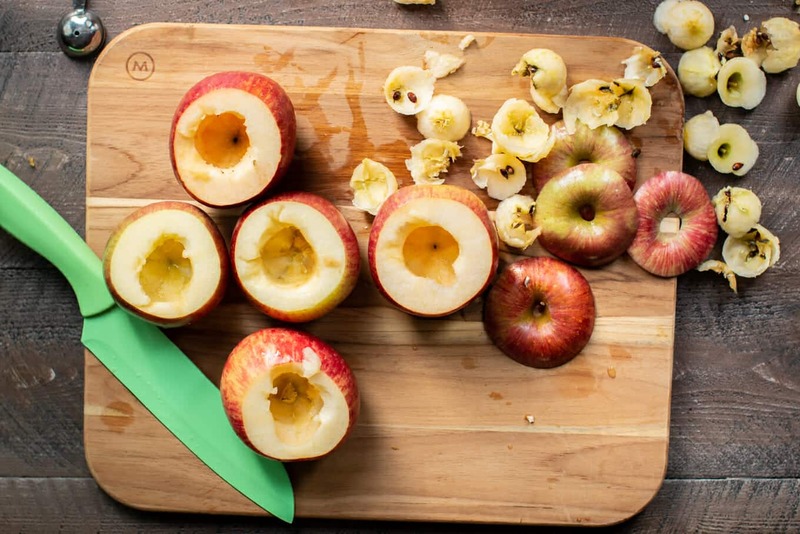 With a melon baller tool, or a measuring teaspoon, remove the core and seeds from each apple. 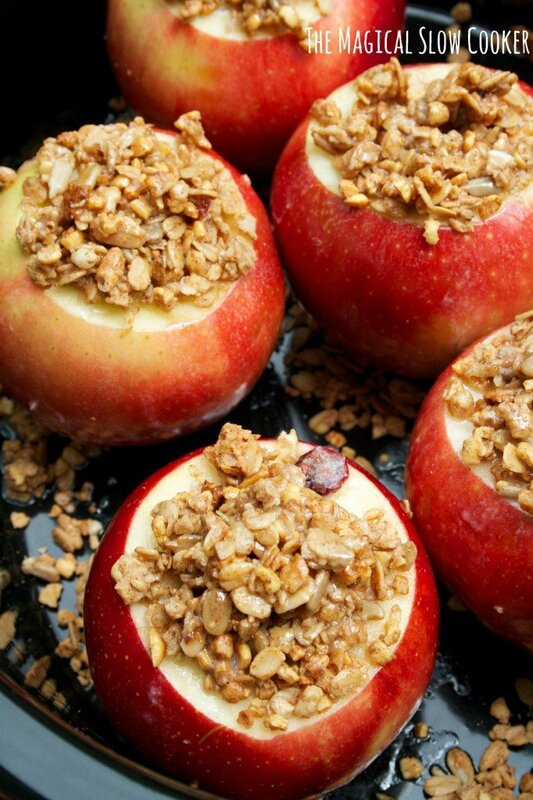 Pack 1/4 cup granola into each apple, and place into the slow cooker. 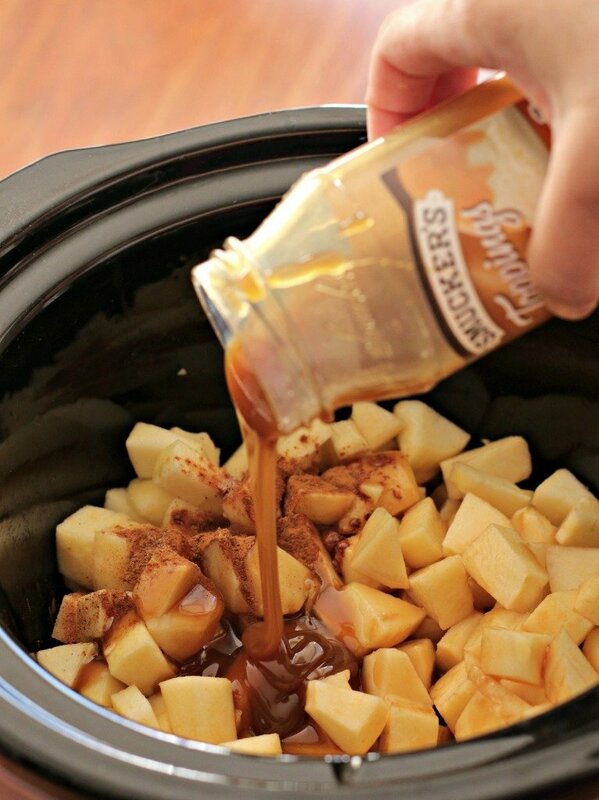 Drizzle the apples evenly with the melted butter, and add a teaspoon of maple syrup to each apple. Cover, and cook on high for 2.5 - 3 hours until tender, but not falling apart. Serve as is, or add ice cream or whipped cream. ENJOY! Nutritional values are approximate. Please use your own calculations if you require a special diet. Recipe values are for 1/5 of the recipe. Those look delicious! I would be like you — once I smelled them there would be mo waiting until the next day! And there is nothing wrong with a little ice cream for breakfast — it is dairy! I gotta try this recipe. Baked apples taste divine. I’m trying this recipe today. will let you know how it turned out. That looks so good can’t wait to try. I love easy. 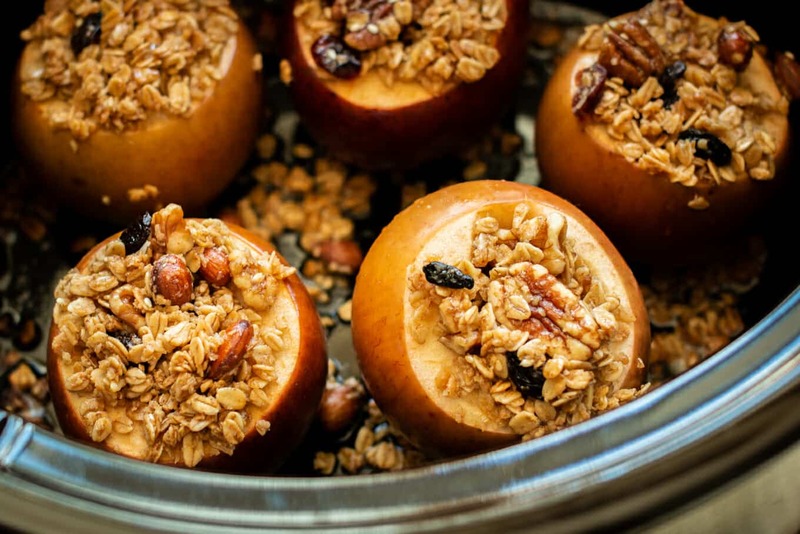 These look like they will be wonderful and I love baked apples but don’t do them much in summer(don’t like to heat up kitchen) but with this way I can have them all year!!!! I’m gonna try this with a mixture of Bear Naked Cinnamon granola & Bear Naked’s new granola called Sea Salt Caramel Apple! Can’t go wrong with more apple flavor! That sounds awesome Gaya! I’ll have to look for that flavor, sounds so good! can also wrap in foil and do over hot grill while cookin out. Quick question about making these for breakfast: did you put the slow cooker on a timer, get up early, or were you able to set it on low for most of the night? My slow cooker doesn’t have a timer so it would be good to know how feasible this would be for me. Thanks! I got up early 🙂 It would be too long to set them on low. I hope that helps. none, the butter is enough moisture for this recipe. And the apples add a lot of moisture too. Nice recipe. Can these be frozen and served later? How would you re-heat them? can you bake these in the oven if you don’t have a slow cooker or to speed up the process? I would think so! Here is a good recipe to go by with oven instructions: http://www.foodnetwork.com/recipes/paula-deen/baked-apples-recipe.html#! Do you think that you could use oats instead of granola?